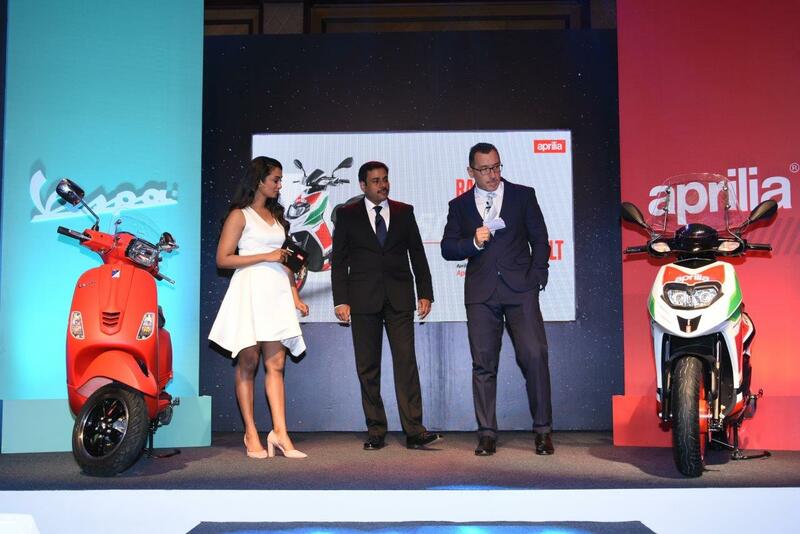 Aprilia officially launched three new models – SR 150 facelift, SR 150 Race and limited edition Carbon SR 150 in India as part of the second year anniversary of the brand in India. All these scooters now come with mobile connectivity in which users can connect to the scooter and control various features through the application from the smartphone. The application can be connected to the scooter via Bluetooth and comes with features like accurate GPS location, emergency contact details, service centre locator, panic alert and find me feature in which users can identify and locate their scooter even with ignition off mode, vehicle status, connect with customer care executives and more. The SR150 facelift model continues the sporty design theme of its predecessor and the instrument cluster finally get an LCD screen with orange backlighting, but the speedometer is still analogue and fully digital cluster would have been made it more modern. The updated scooter also gets an adjustable suspension at the rear and 220 mm disc brake at front. Aprilia has also made some changes for CVT transmission and the SR150 now comes in four new colours – matt black, blue, glossy red and white. The SR150 Race gets RS-GP theme inspired by MotoGP bikes and it is finished in a white colour with red and green body graphics. The company has also given golden calliper and a specially designed race theme helmet. The limited edition Carbon SR150 took inspirations from carbon components used in the racing bike and it is finished in all black colour with new graphics. The Bluetooth connectivity is standard on both Race and Limited Edition models, optional on regular SR150 and all scooters comes with USB port for charging smartphones. The SR150 range is powered by same 155cc single-cylinder engine producing 10 bhp of power and 11 Nm of torque. This engine is mated to CVT automatic transmission. The facelift model is priced at Rs. 70,000, Limited Edition Carbon at Rs. 73,500 and Race at Rs. 80,200 (all prices, Ex-Showroom, Pune). Vespa is also celebrating its sixth anniversary in India and the Italian manufacturers introduced an update for SXL150 and VXL150. Both these scooters come with machine cut alloy wheels and it comes with the same connectivity features as Aprilia SR150. The SXL150 and VXL150 are available in three new colours – Matt Rosso Dragon, Matt Yellow and Azzuro Provenza. The company hasn’t made any mechanical changes for SXL150 and VXL150 as they are powered by 150cc single cylinder, air-cooled engine producing 11 bhp of power and 12 Nm of torque. The VXL150 is priced at Rs. 91,140 and SXL150 at Rs. 97,276 (Ex-Showroom, Pune). Vespa has also added all black limited-edition Notte to 125 cc series and it is priced at Rs. 68,829 (Ex-Showroom, Pune).